The Ely Cathedral is the center point of the city. One of my favourite Cathedrals in England is definitely Ely Cathedral in Cambridgeshire. I have visited this Cathedral a couple of times now and every time I have been amazed at the beauty and architecture of this Cathedral. Ely is only a 25 minute drive from my parents house so it is one of the first places my mother takes any visitors from South-Africa. The Cathedral is filled with many different architectural styles, all blending together to make a striking whole. History abounds around every corner, and the beauty created by artists in wood, stone and glass is seen everywhere. Ely Cathedral is the only UK building to be listed as one of the “Seven Wonders of the Middle Ages”. Visible for miles around, the Cathedral is often referred to as “The Ship of the Fens”. The Fens a coastal plain in eastern England so is very, very flat. The city of Ely may be small in comparison to other cities but its Cathedral is a magnificent structure with a history dating back over 1300 years. Despite its remoteness, Ely has an association with well known Kings & Saints who have shaped the history of England. The Cathedral was first a monastery, built in 673 A.D it was destroyed by the Danes after 200 years. The present structure dates from 1081 and is a remarkable example of both Romanesque and Norman architecture. It was during the early part of the 12th Century the existing monastic church achieved Cathedral status and since that time there have been various additions, changes and restorations throughout the centuries. Some parts of the cathedral have very intricate stone or wooden angel carvings, which look quite gothic. The plan of the building is cross-shapedand has massive oil warmers to keep the Cathedral heated during winter. But because the Cathedral is so huge it was only slightly warmer than outside and we kept our gloves and jackets on while exploring. At certain times of the day there are free tours of the Cathedral that is a must if you want to learn a lot about its rich history and architecture. 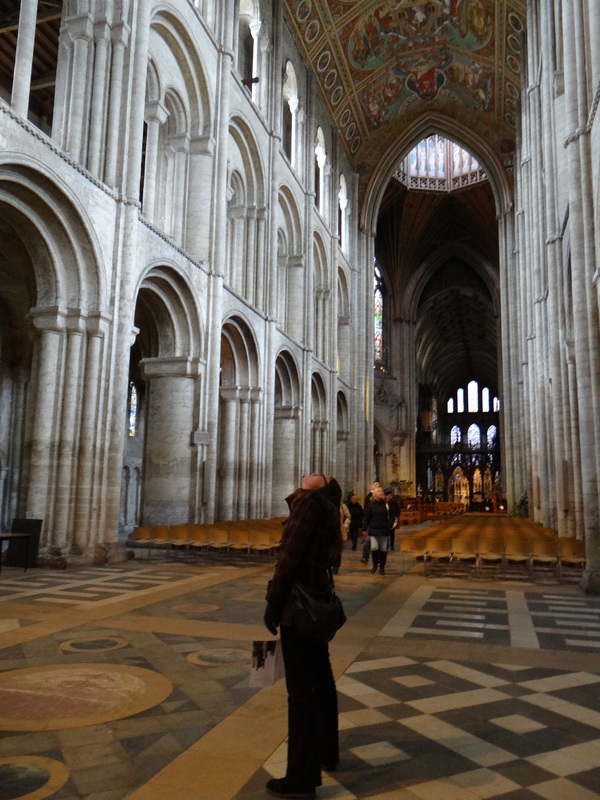 The nave is over 75 m long and is actually the third longest in the UK, and the same length as Ely High Street. Walking down this nave my eyes were turned upwards towards it’s spectacular roof of painted panels which depict the Jesse Tree, and move from Creation to Revelation. This story can be seen as you walk from the West End up to the Crossing, and believe me by the time we reached the crossing my neck was hurting. The angels painted below the windows are purely Victorian inventions, a product of the restoration under Thomas Gambier Parry in 1874. I think they are a fabulous addition to this beautiful Cathedral. Ely is one of the few remaining Cathedrals to have resident choristers. The boys’ choir has been part of the English Choral tradition since the mid-16th century and can be traced back considerably further to the time of King Canute. Today the world famous choir consists of some 22 boy choristers and six adult lay clerks, and can be heard most evenings at Choral Evensong as well as on Sundays and Feast Days. Look at the beautiful windows! In 1321 work began on a massive (100′ long by 46′ wide) free-standing Lady Chapel the largest of its kind in the UK. It is linked to the cathedral by covered walkways. I am always struck not only by its size but by the extraordinary sense of light and vastness of this magnificent space. This beauty is tempered by the destructiveness of the Reformation, as many of the carved figures in the walls are either beheaded or defaced. I am sure this Cathedral will see me again on my next visit to England. beautiful cathedral i didn’t know … thanks for posting. i’m not a big fan of Victorian additions myself. 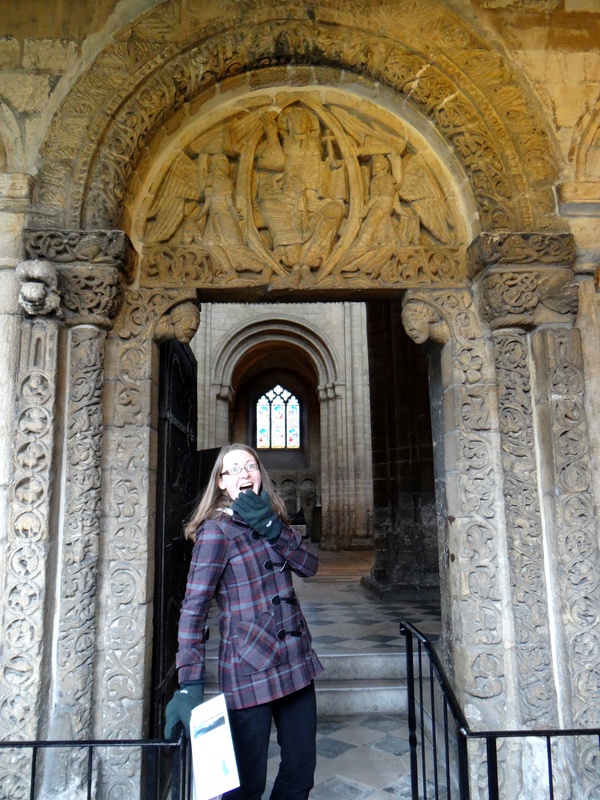 i prefer the original medieval carvings and intricate designs… but you’re right, they do add something to the whole. I also love medieval Cathedrals, and the Gothic Cathedrals are my favourite!! England has a mixture of them all and I still have so mane that I want to visit. Thank you so much!! I do love taking photos…and sometimes I do try to stop myself as I don’t want to only experience the places through a lens. But I have been to this Cathedral more than once, so I have had a couple of opportunities to capture it through my lens. Wow and wow! I didn’t know that the cathedral is a Wonder. So worth a few lovely hours of wandering. ‘Love it! It is definitely worth a very long visit! Make sure you attend one of the guided tours as you do learn a lot about the Cathedral and its colourful history. What a grand tour! Thank you so much, Janaline! Thanks Amy, glad you jenjoyed the journey!! Thanks for the tour, Janaline. This is a place I really should get to see one day…perhaps on my next journey North, I should plan a large detour! There are so many beautiful places that your detpour might end up taking you a couple of days Sue!! Well, yes, that is true…. Interesting post Janaline, thank you for the tour around such a wonderful building. I nearly got to see it on the way back from Norfolk last August, but because the car was full of luggage etc. we didn’t stop. Definitely on the list! I do hope you get to see iyt next time, it is definitely a magnificent Cathedral and ended up being one of my favourite “England” Cathedrals! Thanks Sonel! This Cathedral was actually 20 minutes drive from where my parents live so I ended up visiting it a couple of times. Thank you!! It is such a beautiful Cathedral that I probably ended up taking way too many photos!